Ovarian cycle. 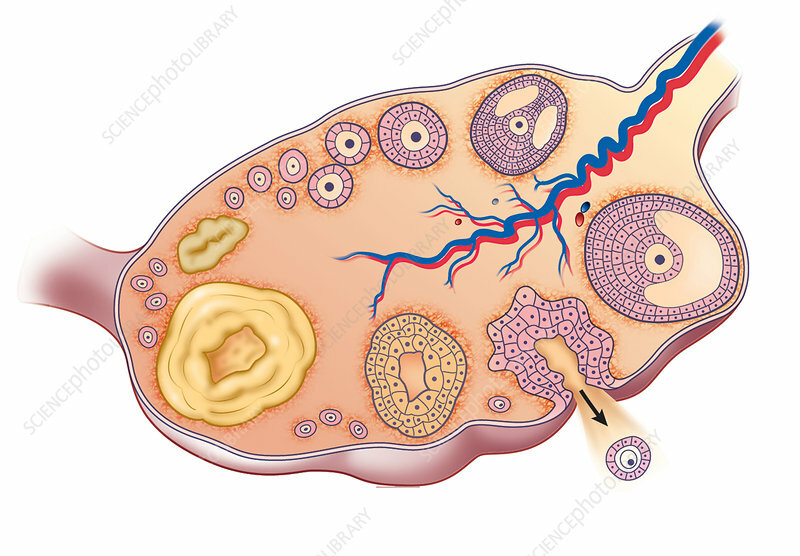 Artwork showing the development cycle of female reproductive cells (ova) in the ovary. Once sexual maturity is reached up to 20 oocytes start developing into eggs every menstrual cycle. Only one will reach full maturity as a Graafian follicle (right) and release its egg at ovulation (lower right). The follicle then develops into a corpus luteum (yellow), which secretes progesterone to build up the lining of the uterus, ready for a fertilised egg. If there is no fertilised egg after 12 days it stops secreting and degenerates.